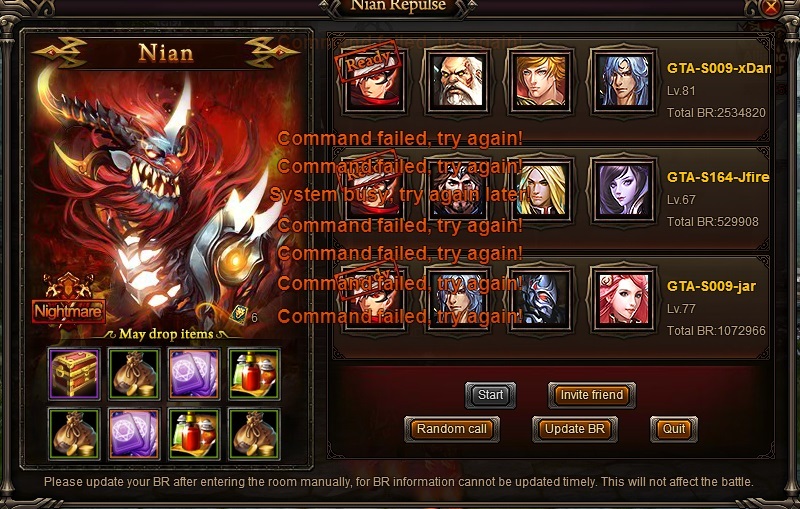 Is anyone else experiencing the same Nian Bug error as me? Whenever I try to join a room, I always get to this bugged room window. 1.) Clicking Start button doesnt work, it\'s disabled. 2.) Clicking \'Quit\' button will show Command failed! Try again. 3.) Clicking \'X (close) button will enable you to get inside the Nian window again but once you join any room, same window will appear. 4.) I\'m able to create a new room but same problem still arises whenever I try to join one. Joining a room will show this bugged interface. 5.) Cleared cache & restarting PC didn\'t work either. If you have noticed, you will sometimes join my room by using the quick join button. Please be advised that it\'s a Ghost room due to this bug. You have less than 5 seconds to do this, ask your alliance member to create a room for you with an easy to type password. Then once you have entered the Nian Room window, quickly join his room and let him start it ASAP. Remember: you have less than 5 seconds to do this or the bugged window will show up again. Thanks to Zgod for teaching me the holy way. no we dont half to nothing its the techs that half to do there jobs and but blow it off how long as this been going on btw..
2019-4-23 08:39 GMT+8 , Processed in 0.053738 second(s), 42 queries .